Dimensions: 27.4 x 21.6 x 3.8mm (1.08 x .85 x 0.15") (L x W x Th). Maximum input voltage: 5.0 volts. 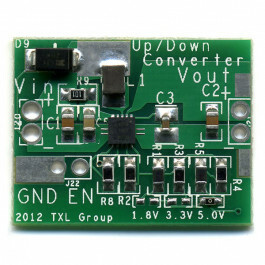 Output voltage: 1.8, 3.3, or 5.0 volts. This DC/DC Voltage converter circuit will step up or step down (boost or buck) to maintain the selected output. Default jumper set to 5.0 volts. Can easily be moved with small tip soldering iron.